Jakarta is massively big and enormously bold for an Asian city. 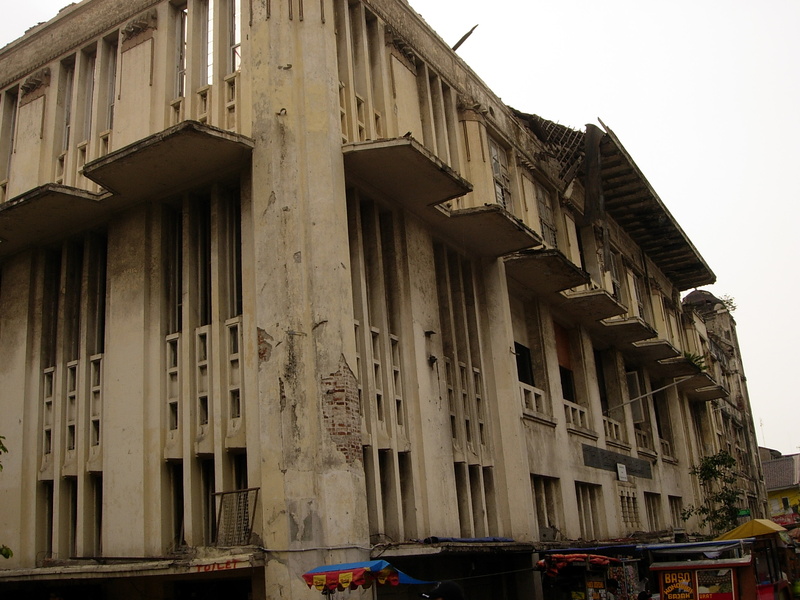 It may not have the glitziness of Hongkong nor the glamour of Singapore but it is BIG. 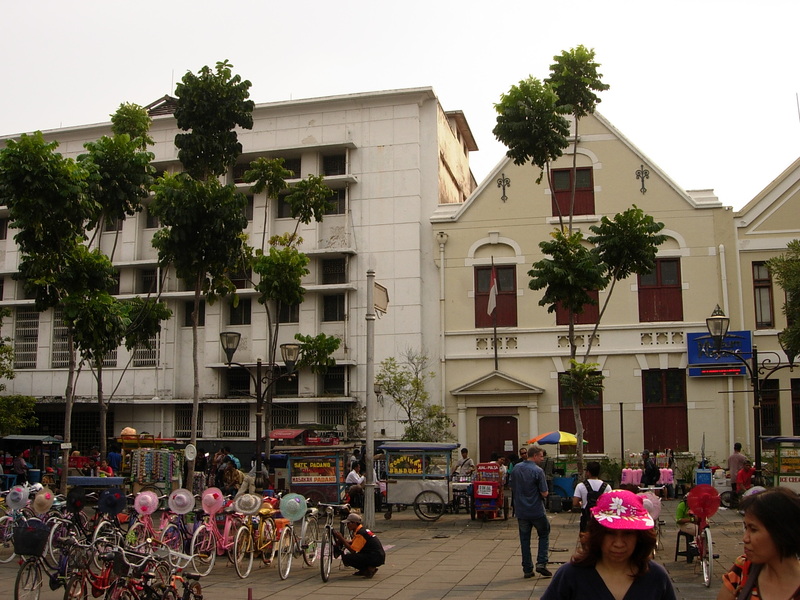 HCMC is also big comprising several districts but it still has a small city feel. Jakarta somehow seems to loom large. 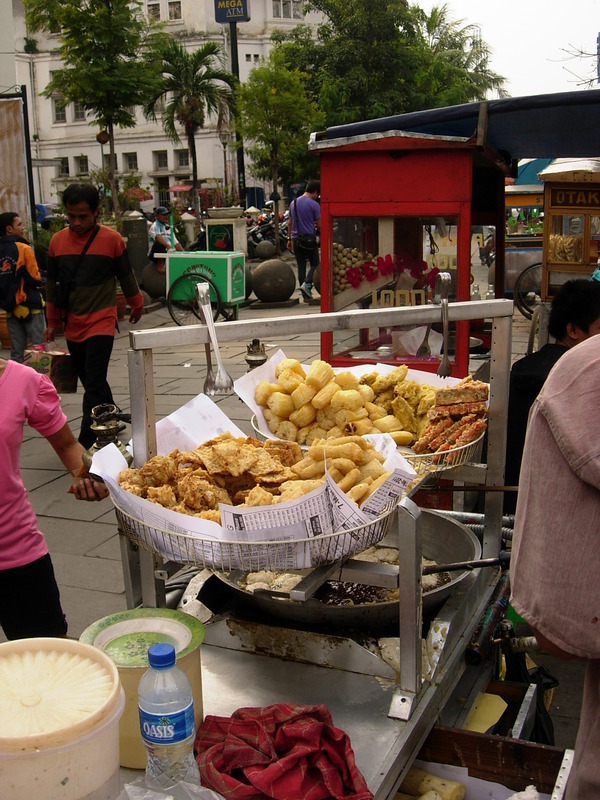 If New York is the US of A’s Big Apple, then Jakarta may very well be the Big Durian. The massive shopping malls, the skyways, and the traffic jam can make you forget that you’re in Indonesia but a prayer coming from a nearby masjid (mosque) or the many masakan padang remind you that you are in the city of durian. Our first taste (literally) of Jakarta was at a masakan padang just outside our accomodation where we had some ayam (chicken), telur (vegetables), and nasi putih (steamed rice). It was well past midnight and we were hungry coming from the flight from Manila which arrived close to midnight, Jakarta time (an hour behind Manila). The guys from Blessings Mansion who picked-us up were very nice and my ability to communicate with them with in their own language came-in very handy. We invited them to eat with us but they opted for the smarter choice—fresh off-the-wok nasi goreng (fried rice_ from a street-side stall. Jeannette and I couldn’t resist so after our padang meal we shared a portion. It was enak (delicious) and for only Rp 8,000 (roughly Php 40) it was definitely murah! Blessings Mansion is actually a residential condo so there weren’t much tourists around. We were met by the owner, William, a tall Chinese guy, at the lobby and escorted us to a 16th floor apartment with 2 rooms, a kitchen with a fridge and cooking appliances and eating utensils, a small living room with a tv, and a dining area. Jeannette, Rhoda, and Julie shared a room while I had the other one all to myself. Best of all was a small balcony where the hot air from the air con made drying our laundry easy. It was a little far from the center as it was in the west side but the place was nice enough and there were nearby eateries, atms, a fast-food, grocery, and internet. It was a good and affordable place to stay-in though it’s a wee bit far from the city center and with Jakarta’s notorious traffic, it can be a nuisance. But nevertheless, I’d probably stay there again. Plus there’s a really nice pool you can use. The next morning, Jeannette and I bought some food at a nearby masakan padang for breakfast. We had some chicken, shrimps, and egg plant. “Tidak terlalu sambal,” I told the guy as we didn’t want it too spicy. We also bought some snacks at the food court at the condo. The martabak was yummy! We hired a car for $50 for a 10-hour drive around the capital to take in the sights. It was a Saturday so it was quite traffic. We had the same driver as the previous night. 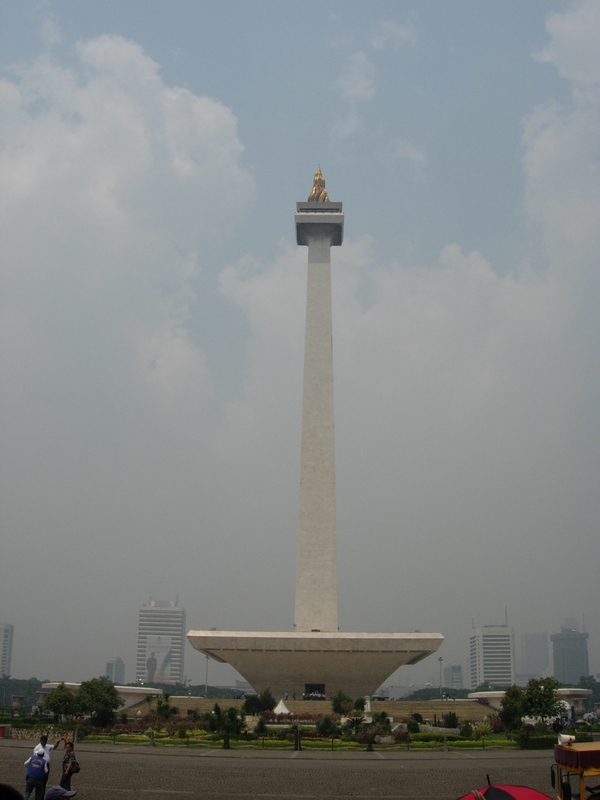 First stop was the Monas (Monument Nasional) dubbed as “Sukarno’s Last Erection” as the past president had a thing for erecting monuments. In fairness, it looked nice standing proudly up amidst the green park. There was a long queue to get to the top to view the smog-filled city so we simply walked around the grounds. 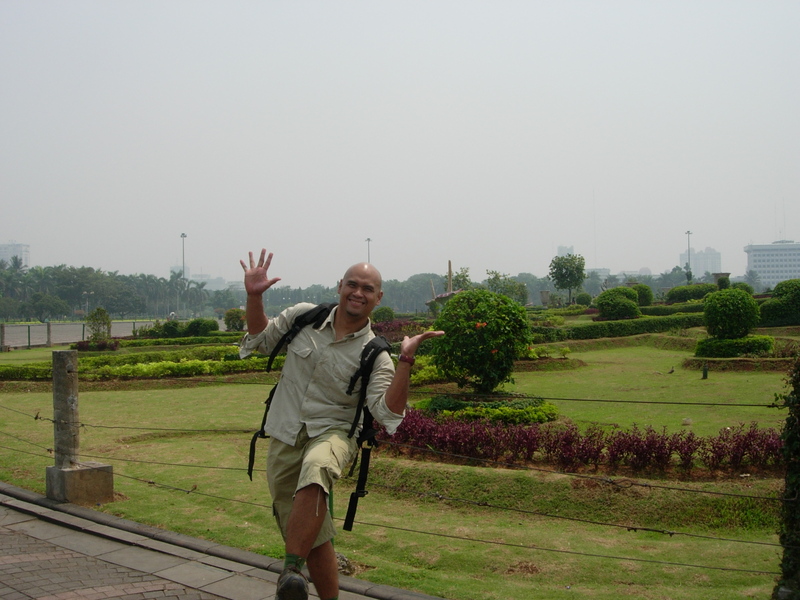 There really wasn’t much to explore the place was simply one big park with the Monas dominating the center. It was really hot and there wasn’t enough greenery to offer some shade. Interesting was the bus that had been converted into a toilet complete with air-conditioning and cost Rp 2,000 per use. We took one of the free electric shuttles back to the main gate where vendors thronged around us shoving air botol, pens, and other oleh-oleh wisata (tourist souvenirs). Because I told our driver to bring us to a “rumah makan yang jangan terlalu mahal” (a restaurant that is not too expensive) he brought us to a local eating place. I had the house specialty which was shredded chicken and beef meat in a semi-spicy coconut-based sauce served with cang kong and a delicious spicy side dish made of crackling beef fat similar to our chicharon. Jeannette and I, the only ones who could eat anything spicy really enjoyed it. For dessert, we got a couple of plastic-wrapped sweets from the counter. It was a banana slice with sticky rice flour flavored like chocolate. It kinda reminded me of the taste of Leyte’s moron. 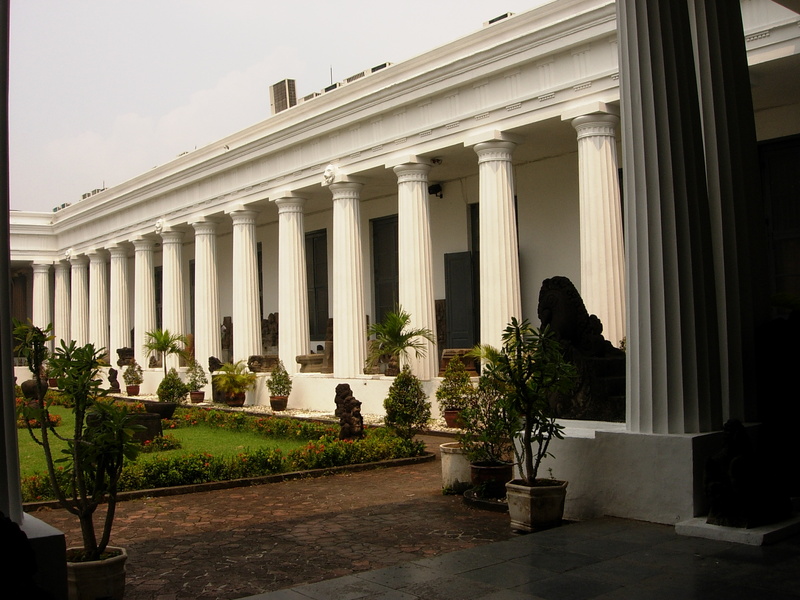 More interesting was the Museum Nasional which our driver didn’t know existed! I had to point him the directions as he was driving towards Kota already and existing that there were museums there. I had to tell him I wanted to see the Museum Nasional which was dekat di (near the) Monas. The building and the galleries were a little run-down but the artifacts on display, particularly at the ethnography galleries were outstanding. 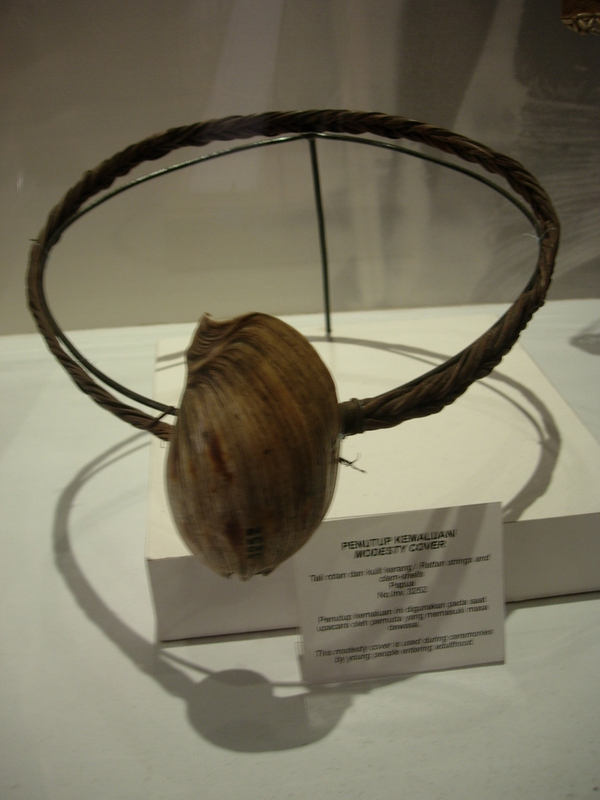 Each of Indonesia’s ethnographic groups were well-represented with interesting displays of their clothing, every day household, agricultural, fishing, and household implements, as well as ritual and ceremonial tableaus. There were even mini replicas of the myriad houses of the different people. Move over 2xist! This bikini was invented even before you even thought about bikinis! 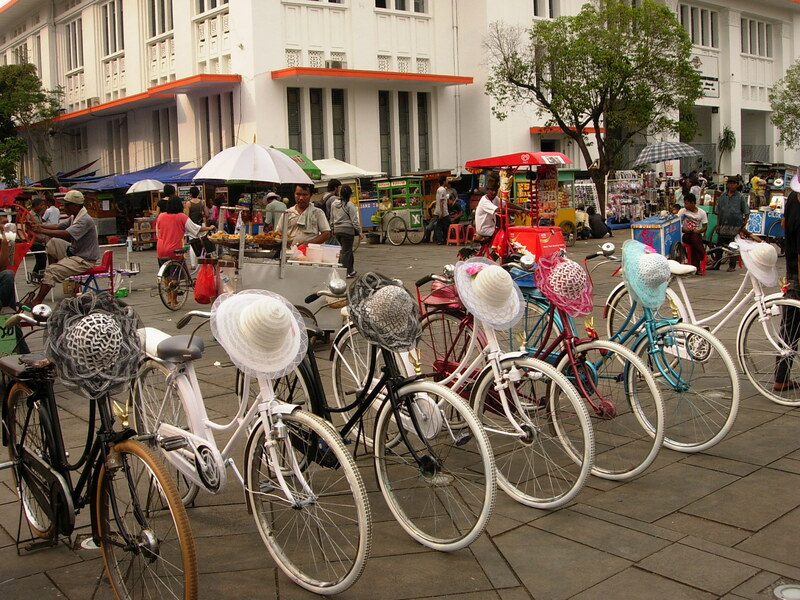 Kota, once the old Dutch capital called Batavia, had some beautiful colonial buildings set around a square filled with locals out on a Saturday stroll. A myriad of stalls sold snacks but we were too full to try any of them. I was particularly interested in some of the fried stuff and the satay. Jeannette and I had the durian es krem instead. 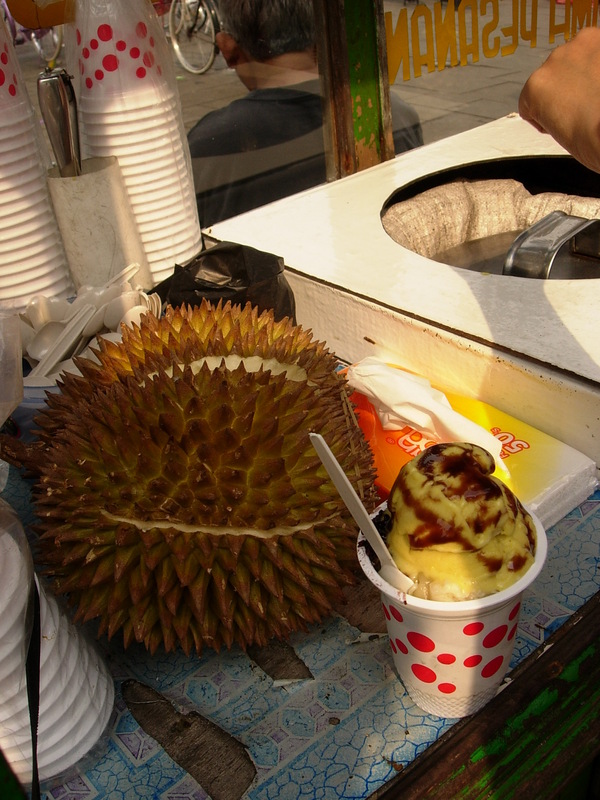 A cup of home-made durian ice cream topped with a durian fruit and a some chocolate syrup only cost Rp 5,000. Sangat enak! (really delicious). Durian ice-cream? Sure I’ve had that before. But real durian fruit with durian ice-cream is definitely durian heaven! Underneat that durian ice cream is one whole durian fruit waiting to be relished. 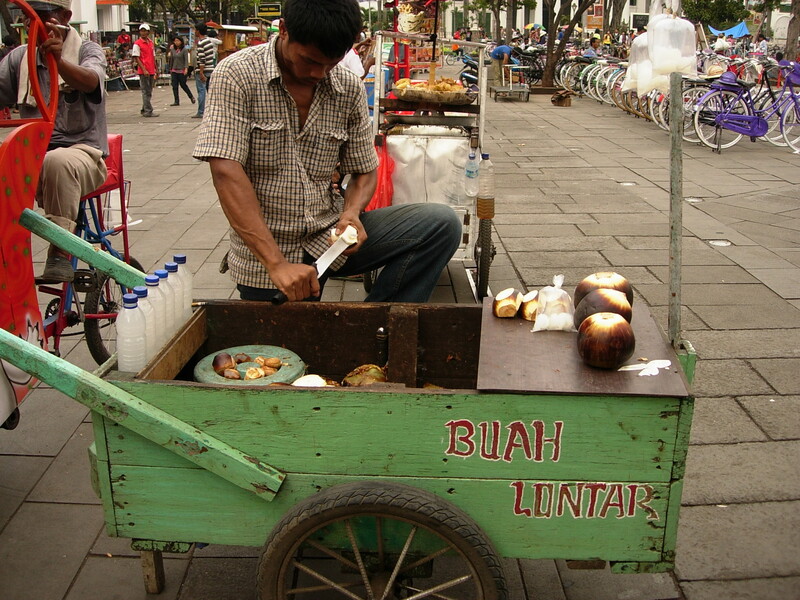 Buah Luntar is a coconut-like fruit that is utterly tasteless and chewy. I wonder what the Indonesians get out of it? Anti-oxidants? Vitamins? 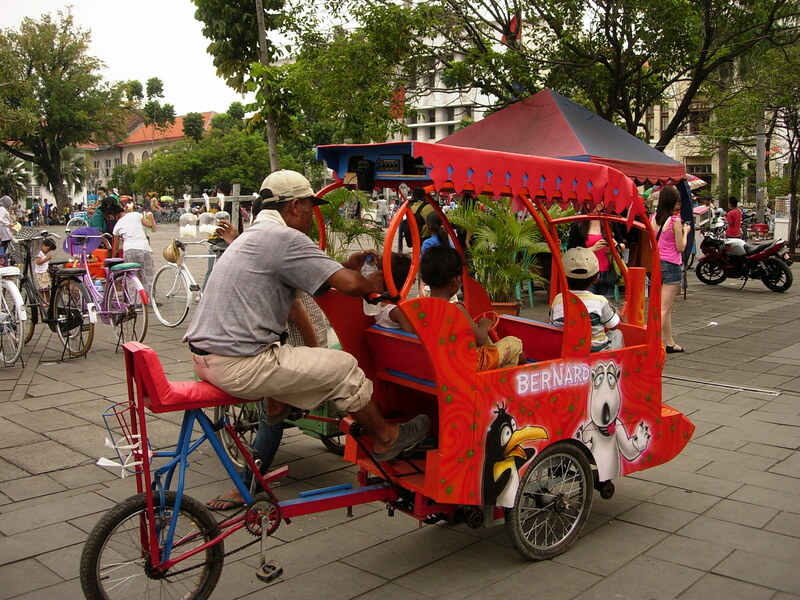 One of the more interesting things we saw at the plaza was a small stationary mobile where four little kids where seated inside while a man cycled which caused the seats to go up and down while music played. It was really fun to watch and we could just imagine how strong the man’s legs were. Jeannette joked that I should set one of those inside the gym and invite their parents to bring their little kids along. Maybe I should set one up like this in the gym. Parents cycle with their kids' body weight as resistance. Rent a bicycle and you get to wear a nice hat too! The Wayang Museum was closed already which was unfortunate was it was supposed to house a good collection of puppets from around Indonesia. We browsed around the shop instead. Nearby Sunda Kelapa, the old Dutch port, was lined with Massaker schooners that in spite of their age, still stood magnificently proud even as workers were hammering the steel bodies to remove the rust. Some were being loaded with goods while most stood idly by. We ended the day at the Ciputra Shopping Mall which wasn’t really nice as it was little crowded with narrow aisles and small stores and seemed to cater to the masses. I dropped by Gold’s Gym at the basement. Membership Consultants greeted me as I entered and introduced myself as coming from Gold’s Gym Philippines whereupon I was promptly attended to. I was impressed by how nice and well-maintained the facilities were. The staff, especially the manager was really accommodating and very welcoming. The manager even gave Rhoda two small tubs of skin scrubs. We had dinner at the food court on the fourth level called the Food Library. The ordering procedure was similar to the food courts in Bangkok where you pay at a centralized cashier. But at the Food Library, you order from any of the stalls with a variety of food on display such as satay, baso (meatballs soup), nasi campur (rice toppings) and a whole lot of yummy food to choose from including some Japanese and Chinese dishes. They give you an order slip which you pay for at the cashier then you show the receipt to the stall to collect your food. I had an iced cendol for dessert (yup, dessert always comes first), a baso and some curry. The goat, beef, and chicken satay that Jeannette, Julie, and Rhoda had were really yummy. The meat was very tender and tasty. On the way out, we passed by J Co, a donut store which had a tempting display of donuts in a variety of interesting flavors with funky names. I bought a box to eat back at the apartment. I swear, they can give Krispy Kreme a run for their money! 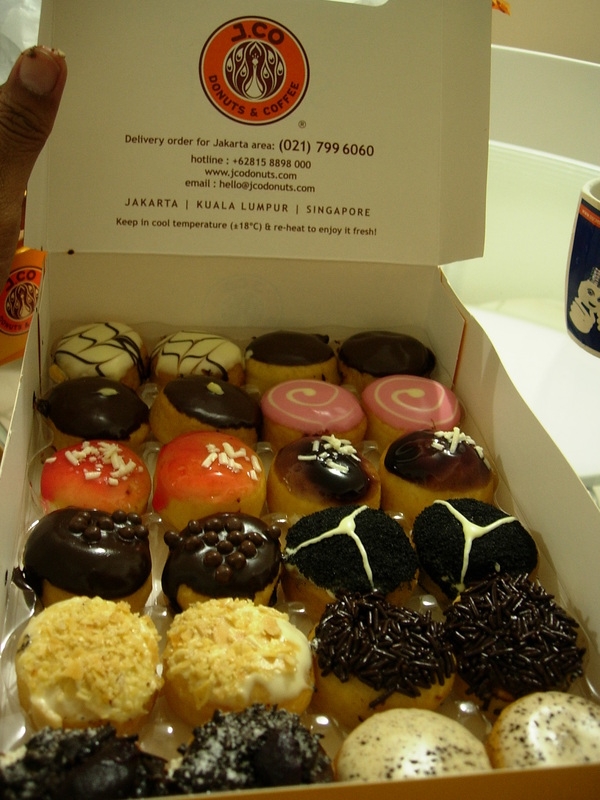 The donuts were simply soft and delicious with none of the artificial flavor taste. It took about two hours to get from the mall back to Blessings Mansion considering it was just about 1.5k away. Traffic was really bad and we were moving at a snail’s pace. I went to the internet shop first to do online check-in for our Air Asia flight to Jogya the next day.